Description of "Organic Seed Market Size, Growth, Forecasts and Trend Analysis, 2016 to 2024 (eBook)"
The global organic seed market is expected to be valued at approximately USD 1.6 billion in 2015 and it is expected to grow at approximate CAGR of over 14 % over the forecast period of 2016 to 2024. Growing health consciousness and environmental concerns are expected to remain a key driving factor for market growth over the forecast period. Raising demand of organic seed is owing to negative health issue related to hazardous chemicals in the agriculture industries. 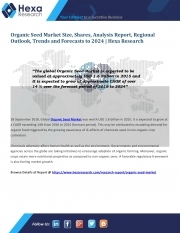 Reviews of "Organic Seed Market Size, Growth, Forecasts and Trend Analysis, 2016 to 2024 (eBook)"